The post-Soviet states, also collectively known as the former Soviet Union (FSU) or former Soviet Republics, and in Russian as the "near abroad" (discussed below) are the sovereign states that emerged and re-emerged from the Union of Soviet Socialist Republics in its breakup in 1991, with Russia internationally recognised as the successor state to the Soviet Union after the Cold War. The three Baltic states were the first to declare their independence, between March and May 1990, claiming continuity from the original states that existed prior to their annexation by the Soviet Union in 1940. The remaining 12 republics all subsequently seceded. 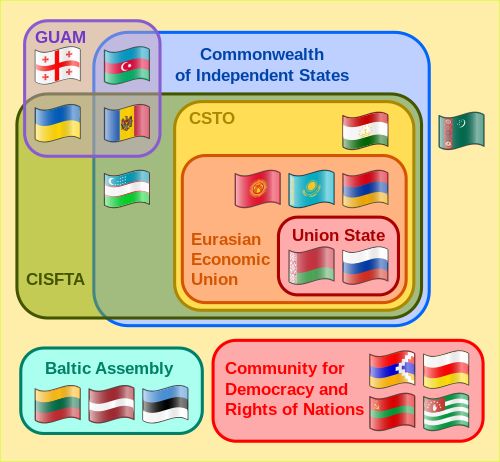 12 of the 15 states, excluding the Baltic states, initially formed the CIS and most joined CSTO, while the Baltic states focused on European Union and NATO membership. Several disputed states with varying degrees of recognition exist within the territory of the former Soviet Union: Transnistria in eastern Moldova, Abkhazia and South Ossetia in northern Georgia and Nagorno-Karabakh in southwestern Azerbaijan. Since 2014, the Donetsk People's Republic and Luhansk People's Republic in Eastern Ukraine have claimed independence. All of these unrecognised states except Nagorno-Karabakh depend on Russian armed support and financial aid. Nagorno-Karabakh is integrated to Armenia, which also maintains close cooperation with Russia. Prior to the annexation of Crimea to Russia in March 2014, which is not recognized by most countries, it briefly declared itself an independent state. In the political language of Russia and some other post-Soviet states, the near abroad refers to the newly independent republics (other than Russia itself) which emerged after the dissolution of the Soviet Union. Near abroad became more widely used in English, usually to assert Russia's right to have major influence in the region. Russian President Vladimir Putin has declared the region Russia's "sphere of influence", and strategically vital for Russia. The concept has been compared to the Monroe Doctrine. Most of the formerly Soviet states began the transition to a market economy from a command economy in 1990-1991 and made efforts to rebuild and restructure their economic systems, with varying results. In all, the process triggered severe economic declines, with Gross Domestic Product (GDP) dropping by more than 40% overall between 1990 and 1995. This decline in GDP was much more intense than the 27% decline that the United States suffered in the wake of the Great Depression between 1930 and 1934. The reconfiguration of public finance in compliance with capitalist principles resulted in dramatically reduced spending on health, education and other social programs, leading to a sharp increase in poverty and economic inequality. The economic shocks associated with wholesale privatization resulted in the excess deaths of roughly 1 million working age individuals throughout the former Soviet bloc in the 1990s. A study by economist Steven Rosefielde asserts that 3.4 million Russians died premature deaths from 1990 to 1998, partly as the result of "shock therapy" imposed by the Washington Consensus. The initial transition decline was eventually arrested by the cumulative effect of market reforms, and after 1995 the economy in the post-Soviet states began to recover, with GDP switching from negative to positive growth rates. By 2007, 10 of the 15 post-Soviet states had recovered and reached GDP greater than what they had in 1991. Only Moldova, Ukraine, Georgia, Kyrgyzstan, and Tajikistan had GDP significantly below the 1991 level. The recovery in Russia was marginal, with GDP in 2006-2007 just nudging above the 1991 level. Combined with the aftershocks of the 1998 economic crisis it led to a return of more interventionist economic policies by Vladimir Putin's administration. Some academic studies show that many former Soviet Republics and Warsaw Pact countries still have not caught up to their levels of output during the twilight of the Soviet era. The post-Soviet states listed according to their Human Development Index scores in 2017 (the report was launched in October 2018). Belarus, Russia, and Ukraine founded the Commonwealth of Independent States (CIS) in December 1991. It was conceived as a successor organization to the USSR, and in December 1993 it included 12 of the 15 former Soviet republics (except the three Baltic states). It currently consists of nine of the 15 former Soviet republics, with one associate state (Turkmenistan). Georgia withdrew from the CIS in August 2008, while Ukraine stopped participating from the CIS in May 2018. The three Baltic states have not sought membership in any of these post-Soviet organizations, seeking and achieving membership in the European Union and NATO instead, although their electricity and rail systems remain closely connected with former Soviet organizations. The sole exception to the above has been their recent membership in the Community of Democratic Choice. Moldova and Azerbaijan participate in the CIS but other than that they mostly cooperate within regional organizations that are not dominated by Russia. Such organizations are GUAM and the Community of Democratic Choice. Although Ukraine is one of the three founding countries of the CIS, it is legally not a member because it has never ratified the 1993 CIS Charter. In 2008, Georgia notified the CIS executive bodies of its decision to leave the regional organization, and according to the CIS Charter (sec. 1, art. 9) this decision went into force 12 months after the notification date. 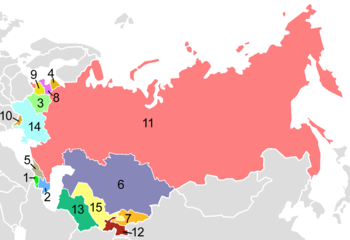 The Commonwealth of Independent States (CIS) consists of 10 former Soviet Republics that differ in their membership status. As of December 2010, 9 countries have ratified the CIS charter and are full CIS members (Armenia, Azerbaijan, Belarus, Moldova, Kazakhstan, Kyrgyzstan, Russia, Tajikistan, Uzbekistan), one country (Turkmenistan) is an associate member and two countries (Georgia, Ukraine) left the organization in 2009 and in 2018. In 2014, Ukraine declined its CIS chairmanship and considered withdrawal from the organization. Russia, Belarus, Kazakhstan created a customs union that entered into force in July 2010. Ukraine, Kyrgyzstan and Tajikistan indicated interest in joining at the time. Russia has been eager for Armenia, Moldova and Ukraine to join the custom union instead of the European Union, and the Moldovan break-away state of Transnistria has supported this. In 2013, Kyrgyzstan and Armenia announced plans to seek membership, but division over the issue in Ukraine led to the 2014 Ukrainian revolution after the Ukrainian government backed out of an EU Eastern Partnership in favor of the union. In 2014, voters in the Moldovan autonomous region of Gagauzia rejected closer ties to the EU in favor of the union. The Eurasian Economic Union is an economic union of post-Soviet states. The treaty aiming for the establishment of the EAEU was signed on 29 May 2014 by the leaders of Belarus, Kazakhstan and Russia, and came into force on 1 January 2015. Treaties aiming for Armenia's and Kyrgyzstan's accession to the Eurasian Economic Union were signed on 9 October 2014 and 23 December respectively. Armenia's accession treaty came into force on 2 January 2015. Although Kyrgyzstan's accession treaty will not come into force until May 2015, provided it has been ratified, it will participate in the EAEU from the day of its establishment as an acceding state. Moldova and Tajikistan are prospective members. Three former Soviet states are members of NATO: Estonia, Latvia, and Lithuania. Poland, a former socialist nation, is also a NATO member. Georgia, where both public opinion and the ruling government favor NATO membership, is in the Intensified Dialogue program with NATO. Ukraine also declared joining NATO as its geopolitical goal once again in 2017 (first time being right after the Orange revolution and in the beginning of presidency of Viktor Yushchenko), after the presidency of Viktor Yanukovych, during which the government officially declared neutrality and ceased to seek NATO membership. Other states in the Partnership for Peace and Individual Partnership Action Plan program include Armenia, Azerbaijan, Belarus, Kazakhstan, Kyrgyzstan, Moldova, Russia, Tajikistan, Turkmenistan and Uzbekistan. The Community of Democratic Choice (CDC) was formed in December 2005 at the primary instigation of Ukraine and Georgia, and composed of six post-Soviet states (Ukraine, Georgia, Moldova, and the three Baltic states of Estonia, Latvia and Lithuania) and three other countries of Eastern and Central Europe (Slovenia, Romania and the Republic of Macedonia). The Black Sea Forum (BSF) is a closely related organization. Observer countries include Armenia, Bulgaria, and Poland. The Shanghai Cooperation Organisation (SCO), is composed of China and five post-Soviet states, namely Russia, Kazakhstan, Kyrgyzstan, Tajikistan and Uzbekistan. The organization was founded in 2001, though its predecessor, the Shanghai Five grouping, has existed since 1996. Its aims revolve around security-related issues such as border demarcation, terrorism and energy. The European Union (EU) with the three Baltic countries that were the first ones to declare independence from the former USSR have never joined CIS after the collapse of USSR (it includes also now some post-communist countries in Central Europe, that have left CEFTA when entering the EU : Poland, Czech Republic, Slovakia, Hungary, Romania, Bulgaria and Slovenia). Central European Initiative (CEI) with Moldova, Ukraine and Belarus (and also Central and South-Western European countries in the European Union; it aims at helping Eastern European countries to reach the EU standards and cooperate politically and find a better economic development and a strong, working but more democratic legal system); it is the only regional organization where Belarus is still a member (but the political cooperation with Belarus is almost stalled, as it is the only country of the former Communist block country that balances in favor of stronger cooperation with Russia and against integration with EU and NATO; however Belarus remains isolated and still does not cooperate too in the SCO group led by Russia and China). None of these organizations are incompatible with the policy required for accessing EU membership in the domain of political cooperation and development. Merging the CEI and BSF is desired by Central European countries, that are members of both (often in addition to EU with stronger objectives) that would like to simplify the development process, and also members of the Council of Europe that federates (but at very slow pace) all European efforts of political cooperation and development through the various regional organizations. It has been remarked that several post-Soviet states have not changed leadership since their independence, such as Nursultan Nazarbayev in Kazakhstan until his surprise resignation in 2019, and Islam Karimov in Uzbekistan, until his death in September 2016. All of these had originally more limited terms but through decrees or referendums prolonged their stay in office (a practice also followed by Presidents Alexander Lukashenko of Belarus and Emomali Rahmon of Tajikistan) Askar Akayev of Kyrgyzstan had likewise served as President since its independence until he was forced to resign as a result of the Kyrgyz revolution of 2005. Saparmurat Niyazov in Turkmenistan ruled from independence until his death in 2006, creating a personality cult around himself. Republic of Artsakh, which is de facto independent from Azerbaijan. Ethnic conflict between Armenians and Azerbaijanis began in 1988, and expanded into war which lasted till a ceasefire in 1994. Sporadic attempts at negotiating a final peace and sporadic bursts of violence have continued since then. Lugansk People's Republic, unrecognized states which declared independence from Ukraine in 2014. Tatarstan, declared itself to be a sovereign state after a referendum on 21 March 1992. Negotiations with Russia led to the signing of a treaty in 1994 which ended Tatarstan's de facto independence, but reserved significant autonomy for the Tatarstan government. In 2002 a new constitution was enacted for Tatarstan which removed the prior constitution's declaration that Tatarstan was a sovereign state. The Tajikistani Civil War that lasted between 1992 and 1997. The Rose Revolution in Georgia, leading to the resignation of Eduard Shevardnadze. The Velvet Revolution in Armenia, leading to the resignation of Serzh Sargsyan. There is a significant Russophone population in most of the post-Soviet states, whose political position as an ethnic minority varies from country to country. While Belarus, Kazakhstan and Kyrgyzstan, in addition to Russia, have kept Russian as an official language, the language lost its status in other post-Soviet states after the end of the Soviet Union. It maintains semi-official status in all CIS member states, because it is the organisation's official working language, but in the three Baltic States, the Russian language is not recognized in any official capacity. Georgia, since its departure from the CIS in 2009, has begun operating its government almost exclusively in the Georgian language. The Central Asian states (Kazakhstan, Kyrgyzstan, Tajikistan, Turkmenistan, and Uzbekistan) plus Azerbaijan from Southern Caucasus are Muslim, except for their dwindling Russian and other European minorities. The Baltic States are historically Western Christian (Protestant and Roman Catholic), which adds another layer of pro-Western orientation to those countries, although the vast majority of what was the Protestant population (Estonia and northern Latvia) there is now irreligious. The dominant religion in the remaining former Soviet countries (Armenia, Belarus, Georgia, Moldova, Russia, and Ukraine) is Orthodox Christianity. In most countries, religiosity has increased since the Soviet collapse. LGBT people may encounter difficulties not shared by non-LGBT residents. In Transnistria homosexuality is illegal. In some other regions, such as Russia and Ukraine, homosexual actions are legal, but there is still discrimination and bias towards the gay community. The Soviet Union inherited environmental problems from the pre-Revolutionary era that it blamed on the failings and evils of capitalism. The Soviet Union promoted environmental sentiments; it had a constitutional clause on environmental protection and promoted the idea that, by ending capitalism, environmental problems would cease to arise. Some environmental strides were made, such as the banning of lead-based paint and leaded gasoline in the 20th century. However, the prioritization of industrial production over environmental protection meant that many environmental issues were left to post-Soviet institutions, particularly air and water pollution in the Northern regions where industrialism was heaviest. The Northern countries of Central Europe, including Poland, East Germany, and Czechoslovakia formed what is referred to as the "black triangle" due to their heavy use of brown coal for energy. Environmental degradation in the former Soviet Union is attributed to rapid industrialization and a lack of institutions that were able to curb pollution levels. Many republics of the Soviet Union experienced soil degradation due to collective farming  In the 1970s, a Soviet study revealed vast technological inefficiencies in the USSR: compared to the West, the USSR created double the amount of pollutants for each product produced, and quadruple the amount of pollution for each car. The Soviet regime also withheld information regarding the environmental problems facing them, and when these problems became evident to the public, authorities continued to attribute them to capitalism. The Chernobyl disaster was a turning point in which the Soviets had to take responsibility for a huge environmental disaster amid pressures to disclose information regarding its causes and consequences, and this led to a broader discussion about the state of the environment as well as to concerns about nuclear energy. As general unrest grew in the final years of the Soviet Union, the public began to demand environmental reform as part of their resistance to Communism. Many citizens wanted to capitalize on the political turnover to achieve an environmentalist agenda. There was a push away from coal and towards cleaner forms of energy in the 1980s, and 1986-1987 saw the first wave of environmental protests. Village Prose literature by authors such as Valentin Rasputin fostered an environmentalist sentiment. The Soviet "Green Front" was a populist environmental movement that had five subgroups: the Social-Ecological Union which promoted environmental solutions based in ecological practice, the Ecological Union which advocated for greater monitoring of pollution, the Ecological Foundation that sought to create funds through pollution taxes, the Ecological Society of the Soviet Union that called for a return to the Russian way of life that was closely connected to nature, and the All-Union Movement of Greens which was a culminating body of the four preceding groups. Russian oil-drilling and the military were among the things they took issue with. Critics of the Green Front opposed their effects on the chemical industry and claimed that it led to reduced commercial product availability of items such as soap, which was in very short supply in the late 1980s, and restricted access to pharmaceutical goods. It was expected that the transition to post-Soviet society would bring about environmental change from both democratic governments and NGOs, but the dissolution of the Soviet Union had both positive and negative effects on the environment. Transition brought about numerous changes that had both positive and negative environmental effects. The abandonment of croplands following dissolution of the Soviet Union led to the creation of carbon sinks. Industrial activity drastically decreased, which reduced air pollution even as the economy took an upturn. However, the introduction of a capitalist market caused new environmental problems: the increase in privately owned cars and the infrastructure changes to accommodate them, the increase in consumerism with no waste management to handle its byproducts, and the poorly-planned construction of retail sites. Environmental clean-up efforts by post-Soviet regimes included institutional changes through the creation of or reformation of environmental agencies, and legislative changes through the introduction of new environmental regulations and their enforcement. However, some contend that the efficacy of these reforms was curtailed by economic troubles in the 1990s. New environmental standards were sometimes used by governments to lower preexisting ones, and many of the post-Soviet initiatives have been criticized as "neoliberal" for their basis in free market principles and belief that the market would correct for environmental problems. Technological innovation was generally directed towards "end-of-pipe" technologies, which deal with the clean-up of emissions and their byproducts rather than the reduction of emissions. Nongovernmental environmental organizations did not exist under the Soviet Union. Rather, some republics had state and local institutions for environmental oversight where citizens could voice concerns, but open criticism of the state was prohibited. Conservation brigades, otherwise known as druzhiny, engaged in preservationist and recreational outdoor activities. However, environmental damage and openings in political freedom in the 1980s led to greater grassroots activism. The Chernobyl disaster of 1986, its cover-up by national, republic and local government officials, and its environmental and health effects spurred many to action. General dissatisfaction with the socialist regime and a push for democratization took an environmental focus. As Soviet citizens became more comfortable with the Gorbachev-era ideals of glasnost and perestroika in the late 20th century, environmentalists became more outspoken in their demands, and radical splinter groups formed in the late 1980s. The opening of borders led to the spread of ideas and partnership with international environmental NGOs who were able to visit and converse with environmentalists of post-Soviet nations. The conservation state institutions from the Soviet era continued to exist into the post-Soviet era but experienced difficulty getting funding due to their connection with the socialist regime in national memory. New environmental NGOs had challenges receiving funding as well as organizing, and the NGOs that survived were not as influential on national decision-making as the state. Many NGOs expressed disappointment with the lack of substantial environmental change during times of political transformation. It has also been contended that environmental issues are of little importance to Russian citizens today. Many former-Soviet citizens abandoned their earlier interest in the environment after the achievement of independence, while continued demands for environmental reform were suppressed. Russia has an expansive amount of land which contains a high amount of natural resources and biodiversity. Protected natural areas, or zapovedniki, were created under the Soviet Union. Soviet leaders attributed former pollution and environmental degradation in Russia to private enterprise and capitalism. However, environmental problems arose in Russia under the Soviets because industrialization was favored over environmentalism, and there was little discussion on how to properly use resources and they were depreciated. The task of environmental governance was distributed among 15 different ministries. There is controversy among academics as to whether environmental destruction under the Soviet Union can be attributed more to Marxist ideology or to the industrialization push. In 1988, the Central Committee and the USSR Council of Ministers formed the USSR Union Republic State Committee for Environmental Control, or the Goskompriroda. The intention of this institution was resource management and environmental testing and oversight. Eventually, however, the Goskompriroda was accused of holding "entrepreneurial interests," particularly related to nuclear power. The 1990s saw experiments in taxing pollution of various forms, though this was largely ineffective due to the low charge levels and inflation, as well as more areas of protected land, but there was difficulty overseeing these areas due to small budgets. In 1991, the Federal Act on the Protection of the Natural Environment was passed in the independent Russian Federation, and the Goskompriroda became the Ministry of the Environment, or the Minpriroda, and developed sustainable development goals. In 1996, Yeltsin demoted the Ministry of the Environment to the State Committee on Environmental Protection, and in 2000 Putin ended the State Committee on Environmental Protection and the Federal Forestry Service and tasked the Ministry of Natural Resources with their responsibilities. In 2001, to the ire of many environmental advocates, Russia passed a law that allowed the acceptance, treatment, and storage of nuclear fuel from other nations for profit. The Environmental Doctrine was passed in 2002, the Water Code was passed in 2006, and the Forest Code was passed in 2007, though these policies have been critiqued for the difficulty in enforcing them. Today, Russia has a low population density with most citizens gathered in the cities, so environmental degradation is concentrated in certain areas. Putin is criticized by environmental advocates for prioritizing economic gain over environmental protection, and there are high levels of greenhouse gas emissions and frequent oil spills. Ukraine is made up of a diverse landscape consisting of plains, temperate forest, and mountains, five densely populated cities, and agricultural land that makes up 70% of the country. Ukraine heavily increased industrial and agricultural production in the Soviet period, which had negative effects on the environment, as did the 1986 Chernobyl disaster. Many of these issues have not been addressed post-independence due to lack of funding. Since independence, Ukraine has experienced a decrease in agricultural and industrial productivity and an increase in diseases, birth abnormalities, and child mortality, claimed to have been caused at least in part from the Chernobyl disaster and from polluted water and air. The number of cars in Ukraine has increased post-independence. Sewage waste has increased, but there has been no increase in wastewater treatment facilities to accommodate it, diverting the waste into natural bodies of water; the Black and Azov seas have been polluted by wastewater, though this occurs less with the reduction of industry; agricultural runoff has led to decreased fish populations, particularly in the Azov Sea. The damming of the Dnipro for hydroelectric power caused flooding in local and residential areas, though the river has been recovering from contamination caused by the Chernobyl disaster. Radioactive waste remains from the Chernobyl accident, the uranium industry, mining, and industrial processing. There are numerous environmental agencies in Ukraine. In 1991, the Ukrainian Ministry of Environmental Protection (MEP) was formed. It manages the environment and its resources, but it has experienced decreased funding and staff since 1996. There is also the Ministry for Forestry, the State Committee on Geology and Natural Resource Use, the State Committee on Water Management, the State Committee on Land Use, the Health Ministry, the Roach Traffic Inspectorate of Ministry of Internal Affairs, and the State Committee on Hydrometerology. Environmental education was also introduced into the school curriculum in the 1990s by the Ministry of Education. Zelenyi svit, or "Green World," was a successful Ukrainian environmental organization whose mission was to hold the Ukrainian government accountable for their environmental failings, particularly the Chernobyl disaster, and to protect the Azov Sea through preventing construction of the Danube-Dnieper Canal. Proper water resource management is a significant environmental concern in the post-Soviet nations of Kazakhstan, Kyrgyzstan, Uzbekistan and the Karakalpakstan region, Tajikistan, and Turkmenistan. Central Asia has an arid climate with hot summers and cold winters. Once within the USSR, the Aral Sea Basin now crosses the geopolitical boundaries of these independent nations. Along with the Aral Sea Basin, Central Asia nations also extract freshwater from the Syr Darya, Amu Darya, and Zeravshan rivers. These rivers receive the snow melt of surrounding mountains. Following the fall of the Soviet Union, the newly-independent states kept their Soviet-era internal administrative structure but were unpracticed in cross-national natural resource management. This has led to conflict regarding proper water allocation to meet the agricultural, industrial, and consumer demands of these nations. Water quality degradation, diversion, and withdrawal has led to increased insecurity and conflict. Most of the water is used for irrigation of agriculture, with Uzbekistan the largest user of agricultural water. Uzbekistan has double the population of its fellow nations and uses 3/5 of regional water supplies. Together, Uzbekistan and Turkmenistan use twice the amount of water for industrial activities used by Kyrgyzstan and Tajikistan. The Interstate Coordinating Commission for Water Resources was formed in 1991 to allocate water from the Syr Darya and Amu Darya but has had difficulty distributing water fairly among nations due to limited funding and physical infrastructure. This has led to conflict between the states. To alleviate the stress on water resources in Central Asia, international organizations looking at the situation have advocated for creation of a river basin commission to represent each nation, equitably distribute water, and peacefully resolve conflicts. It has also been suggested that each nation take responsibility by limiting its downstream environmental effects through reducing agricultural runoff, informing fellow nations of proposed actions which may impact water quality and supply, and sharing data regarding these natural water sources. The three Baltic States are Estonia, Latvia, Lithuania. These nations were de facto part of the Soviet Union after WWII until they restored independence in 1991. Afterwards, they have had difficulty acquiring fuels and meeting their energy needs. For this reason, they were reliant on Russian oil, and did not have the capacity to acquire fuel from other producers, which had led to frequent fuel shortages. Estonia, Latvia, and Lithuania primarily used fossil fuels for energy including imported gas, oil, and petroleum products. The Baltic States used fuels with high amounts of sulfur and pollutants, which has had a negative effect on the environment. Power plants constructed in the Baltic States under the USSR were inefficient, as they were designed to power the entire northwestern region of Soviet territory. During this time, environmental monitoring and regulation was controlled at the local level, but the Baltic States had little influence over the state-managed industrial activities in their area. Concern for the environment fueled a desire for independence from the USSR. Since declaring independence, the energy consumption of the Baltic States has declined due to a decrease in industrial activity, and each nation has created its own environmental oversight body: the Ministry of Environment in Estonia, the Environmental Protection Committee in Latvia, and the Environmental Protection Department in Latvia, all of which were under the legislative branch but independent from executive government. Air pollution was high in the Baltic States due to the high sulfur and other pollutants emitted from their fuel sources. Water pollution was also considerable due to agricultural and industrial activity, as well as the legacy of Soviet military installations. Emission charges were enacted in the Baltic States to reduce pollution levels. Northeastern Estonia and the Narva region in particular was the site of an oil-shale industry which provided electricity and heat. Estonia was the only nation to have ever had an oil-shale based energy system. Mining for oil-shale caused Estonia to have the highest amounts of pollution in the Baltic States. Surrounding nations pressured Estonia to reduce its emissions, but a lack of desulfurization equipment has forced Estonia to instead lower its energy production, which has hurt the nation economically. Water pollution has also been considered among the worst of Estonia's environmental problems because it does not have the infrastructure to effectively treat as much sewage as is created. Latvia produces the least amount of power and pollution and has the highest amount of forest damage of all the Baltic States. Lithuania is the largest producer of electricity of all three Baltic States. Lithuania's land area is roughly 31% forested and is both state and privately owned. Under the USSR, forest and other natural resources were state-owned and centrally managed. The State determined how resources would be used and excluded the public from influencing forest policy. The transition to a post-Soviet political and economic system led to privatization of forests and a market economy. Today, Lithuania's forests are managed democratically and sustainably so as to preserve biodiversity and forest resources. According to July 2012 polling in Ukraine by RATING, 42% of respondents supported the formation of a unified state of Ukraine, Russia and Belarus; earlier in 2012 this support had been 48%. The situation sharply changed after Euromaidan and [[but also for marketing purposes by various companies.]]. A 2016 poll of Russian citizens conducted by Levada Center showed that the majority viewed the collapse of the USSR negatively and felt that it could have been avoided, and an even greater number would openly welcome a revival of the Soviet system. A 2018 poll showed that 66% of Russians regretted the collapse of the USSR, setting a 15-year record. The majority were people older than 55. ^ "Managing Conflict in the Former Soviet Union: Russian and American Perspectives". harvard.edu. 30 October 1997. Retrieved 2 December 2015. ^ a b Van Elsuwege, Peter (2008). From Soviet Republics to Eu Member States: A Legal and Political Assessment of the Baltic States' Accession to the EU. Studies in EU External Relations. 1. BRILL. p. xxii. ISBN 9789004169456. ^ Smith, David James (2001). Estonia. Routledge. p. 20. ISBN 978-0-415-26728-1. ^ a b William Safire (1994-05-22). "ON LANGUAGE; The Near Abroad". The New York Times. Retrieved 2008-04-18. ^ Robert Kagan (2008-02-06). "New Europe, Old Russia". The Washington Post. Retrieved 2008-04-18. ^ a b Steven Erlanger (2001-02-25). "The World; Learning to Fear Putin's Gaze". New York Times. Retrieved 2008-04-18. ^ The Russian Federation technically achieved de facto independence from the Soviet Union after ratifying the Belavezha Accords therefore, Russia became the internationally recognized successor state to the Soviet Union. ^ a b Holds both presidency and executive powers since the former Prime Minister of Turkmenistan role was abolished. ^ GDP decline: transition and Great Depression compared, Kalikova and Associates Law Firm, Kyrgyzstan. Retrieved 13 January 2009. ^ Ghodsee, Kristen (2017). Red Hangover: Legacies of Twentieth-Century Communism. Duke University Press. p. 63. ISBN 978-0822369493. ^ "GDP growth (annual %)". worldbank.org. Retrieved 2 December 2015. ^ "Human Development Report 2018 – "Human Development for Everyone"" (PDF). HDRO (Human Development Report Office) United Nations Development Programme. pp. 198–201. Retrieved 2 September 2017. ^ a b Ratification status of CIS documents as of 15 January 2008 Archived October 30, 2008, at the Wayback Machine (Russian). ^ Georgian parliament votes to withdraw from CIS on BBC News, 14 August 2008. ^ Statement of the Ministry of Foreign Affairs of Georgia on Georgia's withdrawal from CIS Archived September 3, 2008, at the Wayback Machine, 18 August 2008. ^ CIS Charter, 22 January 1993 (unofficial English translation). ^ Reuters (March 19, 2014). "Ukraine Says It Could Quit Russia-Led Bloc". Reuters. Retrieved Jan 14, 2015. ^ Ian Carver (Jan 18, 2014). "Implications of CIS Free Trade Zone Expansion in Central Asia". New Eastern Outlook. Retrieved Jan 14, 2015. ^ Sputnik (10 November 2005). "Working group discusses Uzbekistan's accession to EurAsEC". rian.ru. Archived from the original on May 1, 2013. Retrieved 2 December 2015. ^ Sputnik (12 November 2008). "Uzbekistan suspends Eurasec membership, Moscow unruffled". rian.ru. Archived from the original on June 25, 2013. Retrieved 2 December 2015. ^ Eurasian Economic Community Leaders Sign Group Abolition Agreement, putniknews.com. Retrieved 13 January 2015. ^ "Gagauzia Voters Reject Closer EU Ties For Moldova". RadioFreeEurope/RadioLiberty. Retrieved 2 December 2015. ^ Barron, Lisa (1 October 2013). "Belarus eases current account deficit with Customs Union, Common Economic Space". Cistran Finance. Retrieved 25 October 2013. ^ "Finalization of ratification procedures on Armenia's accession to EAEU to be declared in Moscow today". Public Radio of Armenia. Retrieved 2 December 2015. ^ "Putin said the accession of Kyrgyzstan to the EAEC" (in Russian). Life News. 23 December 2014. Retrieved 26 December 2014. Kyrgyzstan is among the member countries of the Eurasian Economic Union (EAEC). Kyrgyzstan will participate in the governing bodies of the EAEC since the start of the Union - from 1 January 2015. ^ "EAEC: stillborn union?" (in Russian). Deutsche Welle. Retrieved 26 December 2014. Eurasian Economic Union added December 23 Armenia and Kyrgyzstan. ^ Farchy, Jack (23 December 2014). "Eurasian unity under strain even as bloc expands". The Financial Times. Retrieved 26 December 2014. Kyrgyzstan on Tuesday a signed a treaty to join the Eurasian Economic Union, expanding the membership of Moscow-led project to five even as its unity is strained by the market turmoil gripping Russia. ^ "Eurasian Economic Union to Launch on January 1". The Trumpet. 24 December 2014. Retrieved 26 December 2014. Russia, Belarus, Kazakhstan, Armenia and Kyrgyzstan agreed to a January 1 inauguration. ^ Kizilov, Yevhen (8 June 2017). "Рада зробила пріоритетом для України вступ до НАТО" [Verkhovna Rada made joining NATO a priority for Ukraine] (in Ukrainian). Ukrayinska Pravda. Retrieved 14 February 2018. ^ "Poroshenko: EU, NATO membership remains Ukraine's strategic goal, not prospect of 2018". UNIAN. 6 January 2018. Retrieved 14 February 2018. ^ "Regions and territories: South Ossetia". BBC News. 25 April 2012. ^ "Trans-Dniester profile". BBC News. 26 December 2011. ^ Neukirch, Claus. "Autonomy And Conflict Transformation: The Case Of The Gagauz Territorial Autonomy In The Republic Of Moldova" (PDF). European Centre for Minority Issues. Archived from the original (PDF) on 2014-10-14. Retrieved 2014-10-09. On 12 November 1989, a "Gagauz Autonomous Soviet Socialist Republic" was proclaimed by an assembly in Comrat ... In reaction to the Moldovan declaration of sovereignty, on 19 August 1990 the Gagauz leadership proclaimed a "Gagauz Soviet Socialist Republic", which would be independent from Moldova, but part of the Soviet Union ... on 23 December 1994 the Moldovan Parliament passed the "Law on the Special Juridical Status of Gagauzia (Gagauz-Yeri)"
^ Herszenhorn, David; Kramer, Andrew (19 March 2014). "Ukraine Plans to Withdraw Troops From Russia-Occupied Crimea". New York Times. Retrieved 6 August 2014. ^ "Putin acknowledges Russian military serviceman were in Crimea". RT. 17 April 2014. Retrieved 13 August 2014. ^ "Vladimir Putin in TV denial that Russian special forces are in eastern Ukraine". The Daily Telegraph. 17 April 2014. Retrieved 13 August 2014. ^ "Russian Special Forces Storm Crimea Base". Sky News. 23 March 2014. Retrieved 13 August 2014. ^ Naumkin, Vitaly (November 1992). "Islam in the States of the Former USSR". Annals of the American Academy of Political and Social Science. 524: 131–142. doi:10.1177/0002716292524001011. ^ a b c d e f g h i j k l m n o p Bowers, Stephen (1993). "Soviet and Post-Soviet Environmental Problems" (PDF). Faculty Publications and Presentations (Liberty University). ^ a b Thomas, Valerie M.; Orlova, Anna O. (2001). "Soviet and Post-Soviet Environmental Management: Lessons from a Case Study on Lead Pollution". Ambio. 30 (2): 104–111. JSTOR 4315114. ^ a b c d e f g h i Pavlínek, Petr; Pickles, John (2004). "Environmental Pasts/Environmental Futures in Post-Socialist Europe". Environmental Politics. 13: 237–265. doi:10.1080/09644010410001685227. ^ Wernstedt, Kris (July 2002). "Environmental Protection in the Russian Federation: Lessons and Opportunities". Journal of Environmental Planning and Management. 45 (4): 493–516. doi:10.1080/09640560220143521. ISSN 0964-0568. ^ a b c Coumel, Laurent; Elie, Marc (2013-01-01). "A Belated and Tragic Ecological Revolution: Nature, Disasters, and Green Activists in the Soviet Union and the Post-Soviet States, 1960s-2010s*". The Soviet and Post-Soviet Review. 40 (2): 157–165. doi:10.1163/18763324-04002005. ISSN 1075-1262. ^ Schierhorn, Florian; Müller, Daniel; Beringer, Tim; Prishchepov, Alexander V.; Kuemmerle, Tobias; Balmann, Alfons (2013-12-01). "Post-Soviet cropland abandonment and carbon sequestration in European Russia, Ukraine, and Belarus". Global Biogeochemical Cycles. 27 (4): 1175–1185. doi:10.1002/2013GB004654. ISSN 1944-9224. ^ a b c Pavlínek, Petr; Pickles, John (1999). "Environmental Change and Post-Communist Transformations in the Czech Republic and Slovakia". Post-Soviet Geography and Economics. 40 (5): 354–382. doi:10.1080/10889388.1999.10641120. ^ a b c d e f g h i j Carmin, Joann; Fagan, Adam (2010). "Environmental mobilisation and organisations in post-socialist Europe and the former Soviet Union". Environmental Politics. 19 (5): 689–707. doi:10.1080/09644016.2010.508300. ^ a b c d e f g h i j k l m Henry, Laura A.; Douhovnikoff, Vladimir (November 2008). "Environmental Issues in Russia". Annual Review of Environment and Resources. 33 (1): 437–460. doi:10.1146/annurev.environ.33.051007.082437. ISSN 1543-5938. ^ a b c d e f g h i Nazarov, Nikolai; Cook, Hadrian F.; Woodgate, Graham (September 2001). "Environmental issues in the post-communist Ukraine". Journal of Environmental Management. 63 (1): 71–86. doi:10.1006/jema.2001.0460. ISSN 0301-4797. ^ a b c d e f g h i j k l m Smith, David R. (June 1995). "Environmental Security and Shared Water Resources in Post-Soviet Central Asia". Post-Soviet Geography. 36 (6): 351–370. doi:10.1080/10605851.1995.10640997. ISSN 1060-5851. ^ a b c d e f g h i j k l m n o p Salay, Jürgen; Fenhann, Jörgen; Jaanimägi, Karl; Kristoferson, Lars (1993-11-01). "Energy and Environment in the Baltic States". Annual Review of Energy and the Environment. 18 (1): 169–216. doi:10.1146/annurev.eg.18.110193.001125. ISSN 1056-3466. ^ a b c d e Lazdinis, Imantas; Angelstam, Per; Lazdinis, Marius (2007-07-01). "Maintenance of Forest Biodiversity in a Post-Soviet Governance Model: Perceptions by Local Actors in Lithuania". Environmental Management. 40 (1): 20–33. doi:10.1007/s00267-005-0387-8. ISSN 1432-1009. ^ See: Kaprans, M. (2009) Then and now: Comparing the Soviet and Post-Soviet experience in Latvian autobiographiesKeywords 2. ^ Most Russians regret USSR collapse, dream of its return, poll shows. RT. 19 April 2016. ^ "Ностальгия по СССР". levada.ru. 2018-12-19. ^ "Back to USSR: Record number of Russians regret collapse of Soviet Union". RT. 19 December 2018. ^ Maza, Christina (December 19, 2018). "Russia vs. Ukraine: More Russians Want the Soviet Union and Communism Back Amid Continued Tensions". Newsweek. Retrieved December 21, 2018.